Caines said he found out about the surcharge after Tuesday, and explained that it reflects the fact that it’s expensive to do business in the city. “It’s related to the cost of doing service there, for providing the service. It’s that much more costly for us to do business there,” Caines said. He added that Canada Post is trying to hire more people to deal with the understaffing issue, but said the surcharge wouldn’t go towards raising salaries to keep people in their jobs at Canada Post. Now, keep in mind this is the same spokesperson who apparently earlier this week denied any such knowledge of any such surcharge to the reporter from the Today, and who appears to be a deer in the headlights when it comes to the realities, since for months residents have been complaining about lost and delayed mail and parcels, and erratic delivery service in Fort McMurray. I asked Canada Post - repeatedly - to advise how many parcels come into Fort McMurray on a daily basis so I could gauge what this would mean in terms of cold, hard cash into their coffers. And while they did not respond to me (or anyone else) a former local employee did. They informed me that they estimated an average of 2000 parcels come into our community daily, with approximately triple that amount at Christmas. At $5 per parcel, and considering some variances for weekends, one could estimate that Canada Post is looking at about $3 million dollars plus in new revenue - just from this surcharge. And please note that it seems this revenue is not intended to increase salaries to improve retention, and while they are trying to hire more staff it seems this cash is not destined to bump up salaries to entice new employees. And as per the spokesperson above the common wisdom at Canada Post Corporation seems to be that all is just hunky-dory in Fort McMurray and everyone is blissfully happy with their mail delivery....except that this is not seen in the deluge of emails and messages I have been receiving. What I have heard is dozens of complaints, and even more so comments from people who have reached out to Canada Post through Facebook and Twitter and found their comments not only ignored but in the case of Facebook even deleted and their participation blocked so they could not communicate with Canada Post further. I take a dim view of this strategy, as unless an individual is abusive to other customers then their participation on your social media should be encouraged, even if it is complaints because those complaints give you an opportunity to improve your service. If your social media is only present to pay lip service to the concept of dialogue then you are better off not having it at all, because it defeats the purpose of creating that dialogue between service provider and customer, and instead of being good public relations it becomes some of the worst. So, what would I suggest? I would like to see a press release from Canada Post detailing a few things. Since I suspect they never planned to announce this change publicly and you were likely only going to find out about it when Nan in Newfoundland went to send your birthday parcel and got dinged an extra 5 bucks I think the time has come when they cough up some facts. I would also suggest that given this is a Crown Corporation that they not only have an obligation but a responsibility to reply to their customers, who are taxpayers and thus stakeholders in their business. These responses are not "optional", but I would rather suggest they are mandatory, because Canada Post does not "own" us - we own them, and as such we are deserving of some answers. I want to make something else clear. I am not of the "pitchforks and torch" crowd, and I am not looking to burn anyone at the stake. If this decision can be proven to me through sound financial reasoning then I am quite willing to let the matter drop - but if this is a Fort McMurray cash grab, one destined to have an effect on us and those who ship to us, whether they be Nan in Newfoundland or small business in Alberta or massive online retailers, then that should be understood as well. 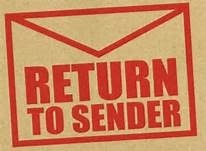 I think it is quite reasonable to not only ask for answers, but demand them - because I am very tired of having my questions returned to sender, like undelivered mail. A big change like this from Canada Post you think would warrent a lot more communication. I'm on the hook for $30 of unplanned "surcharge" next week for items I ordered a couple weeks ago - at that time not knowing about Canada Post's plan. Canada Post seems to have the attitude that everyone here is a millionaire. Not that a surcharge will break my bank but it certainly does suggest that this is their attitude. “Service has improved exponentially in Fort McMurray, we know that for sure. All through the Christmas holidays we had great service up there, parcels were being delivered, everything was fine.” Err NOT - what about the van that burnt? What was in that? Heard your segment on CBC radio this morning, great job! Getting the media involved might be our only hope of getting answers now at this point.